Are You Psychic or Making It Up? 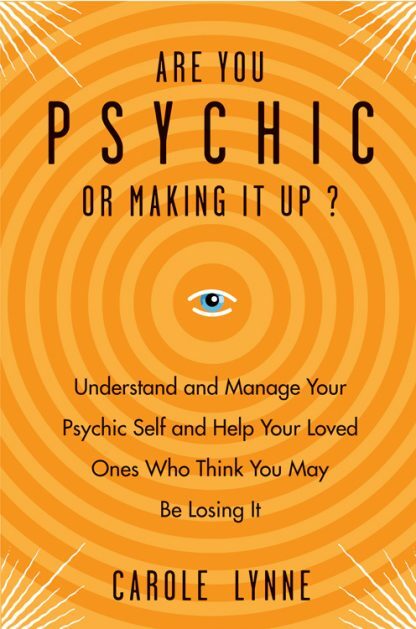 is a must-have book for anyone who is having psychic or mediumistic experiences (and possibly thinks they�re going crazy) and their friends and families. Carole Lynne begins with some badly needed truths. Chief among them: not everyone is psychic. While everyone can develop their intuition and get in touch with the inner psychic voice, those who are psychic and mediumistic have received special spiritual gifts. If that sounds familiar, this is definitely the book for you. Learn how to take care of your �extra sensitive self.� Learn how to evaluate your experiences and to make choices about whether to further develop your gifts. Get advice on what type of further training and study you might benefit most from. And, for friends and families, learn to appreciate your psychic loved ones and that it is an honor to be psychic. Carole Lynne writes from authority earned over decades of personal experience and study, teaching, and working with clients, many of whom come to her for mediumistic readings. Others come to her to learn how to develop their own psychic and mediumistic powers. It is those people and the thousands more like them who will benefit from this book.